https://matcha-jp.com/en/6869 4 Onsen Hotels Near Narita Airport: Enjoy Chiba's Seafood And Great Scenery! If you like hot springs, seafood, and beautiful scenery, then look no further than Chiba! It's a place blessed with abundant nature and excellent hot spring hotels. The fresh bounty from the sea is also attractive. 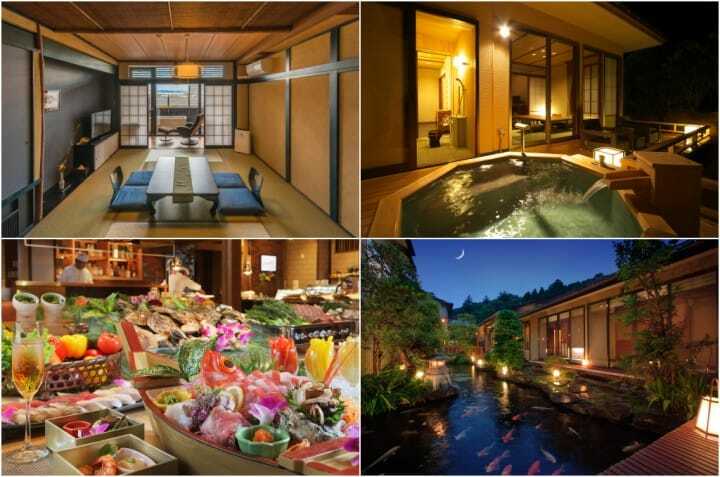 We introduce four special onsen hotels. Chiba Prefecture is a place blessed with hot springs (onsen), delicious fresh seafood, and unforgettable scenery. It can be easily accessed from Narita Airport and Tokyo, and is a popular travel destination in the greater Tokyo area. Today we'll introduce four excellent hot spring hotels in Chiba Prefecture's popular southern region, which is also close to Narita Airport. For those thinking of taking a trip with their family, friends, or partner, by all means try using Chiba as your starting point. As soon as you arrive there you can have a relaxing experience in a local hot spring! Chikurakan is an onsen (hot spring) hotel in Chiba prefecture's southern city of Minami Boso, in an area formerly called Chikura-cho (*1). In the olden days, Chikura was a post town where local fishermen and traveling merchants gathered. At the time, Chikura was also famous as a hanamachi, or geisha quarter, and it was said that many multi-storied buildings called rokkaku were built nearby. Chikura Onsen is said to be the oldest hot spring in the Boso area. Tradition has it that even Minamoto no Yoritomo, the first shogun during the Kamakura period (1185-1333), also sought recovery by soothing his tired body here. *1 Chikura-cho: in 2006 Chikura-cho merged with other towns and municipalities in the Awa district, becoming the present day city of Minami Boso. On the onsen premises there's a large, gender-segregated hot spring pool and also two open-air baths that you can reserve just for you and your group. The hot spring water contains sulphur and is said to be therapeutic for neuralgia and body fatigue. Take a leisurely dip in the bath and soothe and relax your body after a long day of travel. Famous Japanese designer Shigeru Uchida designed the lobby lounge and other areas in the building, including some of the guest rooms. The building combines the relaxed atmosphere of a traditional Japanese ryokan with a modernly designed full-amenity facility. The result is a Japanese ambience and an architectural style that visitors of all ages find appealing. Of course, you can savor many kinds of culinary delights at Chikurakan, including spiny lobster, abalone, golden eye snapper, and other delicacies from the Minami Boso area. Visitors can also experience Japan's traditional and unique irori. While sitting around the fire, enjoy the delicious fresh seafood offered here. Access 3 minutes by taxi from Chikura Station (JR Uchibo Line), and 20 minutes on foot. *There's a complimentary shuttle bus available from Chikura Station to Chikurakan between 15:00 and 18:00 (reservations required). *2 hours by rental car from Narita Airport. For visitors who would like to treat themselves to something special during their trip, we recommend Bettei UMI to MORI, located in Chiba Prefecture's northeastern city of Choshi. The complex is divided into two areas: a hotel and also another building called Villa Zuikaku. The hotel has twenty-six rooms and Villa Zuikaku has six rooms, making for a total of thirty-two rooms. UMI to MORI offers both Japanese-style and Western-style rooms. Whether you want to experience the unique qualities of a Japanese-style room, or have a comfortable sleep on a large bed in a Western-style room, please choose the accommodation that suits both your preference and budget. Villa Zuikaku, a complex that was specially built by the hotel, deserves special mention. With the Pacific Ocean spreading out directly in front, this is an accommodation facility located in a grove of trees where you can relax to your heart's content. There's also an open-air bath on the premises, so you can gaze up at a star-filled sky as you relax in the hot spring. UMI to MORI is located near the Choshi fishing port, where fishing vessels from all parts of Japan converge, so you'll be able to sample freshly caught seafood as well. Sprinkled with some shoyu (soy sauce) from Choshi Yamaju no Hishio, a famous shop in town, the local sashimi is simply exquisite! And you won't be disappointed by the locally grown vegetables and fruit either. Access 5 minutes on foot from Inubo Station. *90 minutes by rental car from Narita Airport. Shunsai no Yado Ryokusuitei is an accommodation facility that has a beautiful Japanese garden. The facility has a main building and also a complex called Bettei Tsuki no Sato. After a relaxing dip in the bath, guests can take a break in the rest area and look at the splendid traditional garden, Ryokusuisen. Colored carp (nishiki koi) can be seen swimming around gracefully in the garden pond. Help yourself to a drink at the rest area's complimentary beverage service and relax as you forget the passing of time. Bettei Tsuki no Sato consists of six villas that are separated from the main building. Far from the hustle and bustle, here you can calm down and relax in a setting that looks like a fairy land. At Bettei all rooms come with an open-air bath. Each room was designed with a different concept in mind, so just deciding which room to stay in will be half the fun! The hotel is also proud of the cuisine it serves. It offers seasonal kaiseki cuisine, characterized by cooking in which the distinguishing features of each ingredient are showcased just as they are. With spiny lobster, abalone, golden eye snapper, eel, and other delicacies on the menu, without a doubt, you'll have a satisfying eating experience. Meals can also be served in the guest rooms, so you can spend some intimate time with your family, friends, or your partner, as you enjoy delicious food. Access 5 minutes by taxi or shuttle bus from Awa-Kominato Station (reservations required for shuttle bus). *About 2 hours by rental car from Narita Airport. A characteristic feature of Tateyama Onsen - Senri no Kaze is the hot spring that has medicinal benefits for both body and skin. The high quality water of this hydrogen carbonate spring will warm and soothe your body right to its core. Known not only for its relaxing effects and ability to ease body fatigue, this is a hot spring that's popular with women because of the water's skin beautifying properties. This onsen also offers many services that will keep satisfied, including being able to choose your own yukata and personal amenities, a complimentary evening ramen service, a drink bar, and delicious seasonal ice cream that's available after a dip in the hot spring. A wide variety of room types are available, from ones that can accommodate families of three to four members, all the way to large rooms that can accommodate groups of eight to ten people. In addition to Japanese-style rooms, there are also Western-style rooms that have Simmons beds, which are used by all the famous hotels. So you are guaranteed to get a restful and refreshing night of sleep. Dinner is another attractive feature of this resort. In 2016, the hotel's managing group acquired its own fishing boat and became head of the local fishermen's organization. As a result, fresh seafood is now delivered directly from the boat to the hotel. In addition to its freshness, the seafood caught in the waters off Tateyama is known for its natural sweetness and moderate amount of fat. At the hotel restaurant, they offer an individually-portioned cuisine course and an all-you-can-eat buffet style course. You can try a variety of refined and elaborate dishes so you'll surely be satisfied with your culinary experience here. Access 15 minutes by shuttle bus or taxi from Tateyama Station west exit. *prior reservations required for shuttle bus *2 hours by rental car From Narita Airport. Fully Enjoy the Charm of Chiba! Did you find a hotel in this article that you would like to stay overnight at? If you are thinking of making a trip to the suburbs of Tokyo from Narita Airport, we highly recommend Chiba with its beautiful ocean scenery, hot springs, and delicious fresh seafood! For those visitors who are searching for interesting spots to visit in the Narita Airport area, please check the following article: The Gateway to Japan: Narita Airport. Chiba Prefecture is a place that's also chosen as a travel destination by people living in Tokyo. Let's head out on a Chiba excursion and experience Japanese cuisine and culture! From Narita Airport: Rent A Car And Enjoy The Great Views Of Chiba!